Which in sleep had fall’n on you. Over the past fifteen years the global anarchist movement has awakened from its long slumber. Anarchist ideas and methods of organising, are gaining a wider acceptance than ever before. However, many people still associate anarchism with violence, destruction, and chaos. This concept of anarchism is reinforced by the corporate media, and those that have an interest in discrediting the anarchist movement. Needless to say this idea of anarchism bears no correlation with the society we are trying to create, or our struggle to achieve it. Anarchism was born in the class struggle and emerged out of the wider socialist movement. 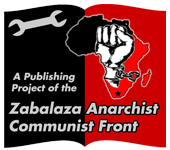 Anarchists wish to replace the economic system in which a minority live off the labour of others, with a system in which the workers, mental and manual, own, and control the wealth of society. This would allow people to decide what it is that they need. This democratically planned production would be orientated towards satisfying people’s needs rather than the insatiable greed of a minority. However, anarchists feel that this control over the economy cannot be exercised through a centralised government. We see freedom as at the very heart of socialism, and the fight to create it. History, rationality and our own experiences teach us that once given control, a ruling group becomes intoxicated with power and feel that they know what’s best for the rest of us. Often they will use their new found power against their enemies, even if they are the people they are supposed to represent. The bitter experiences of Russia, Spain and countless other betrayals throughout history teach us that capitalism and hierarchies cannot be abolished from above. Freedom is not granted by governments or elites; it is won through struggle by workers and other oppressed people. Instead of appointing “good” bosses and leaders to run society for the rest of us, we want people to directly control all possible aspects of their life. We believe that any interaction between individuals should be under the direct control of the participants. The basic democratic structure of our envisaged society would be worker and community councils. Here people could come together to discuss how they want the resources of society to be used. These councils would federate together on a national and international basis to plan production for the larger community. The local councils would appoint delegates to the national, regional or international councils. If a delegate overstepped their remit or went against the wishes of the council they would be stripped of their duties. In all cases the decision-making power would rest with the community rather than the delegate. However, democracy will not simply decide the allocation of goods. In an anarchist society people would also control the manner in which production takes place and the conditions of their work. Anarchism does not simply satisfy our “animal” wants; food, clothes, shelter etc. It offers us dignity, self-respect and control over our own lives. It creates the conditions in which people can develop freely and realise their full potential. Obviously we are nowhere near this idyllic state of affairs. However, anarchists are not utopian dreamers. We recognise that it will be a long, hard struggle until our basic aims are achieved. Rather than sitting back and waiting for capitalism to collapse, or for the revolution to come, we believe in organising in the here and now. On a day-to-day basis anarchists are involved in union and community struggles as well as the fight for gender equality, anti-racist, pro-choice and many other campaigns for a better standard of living and more control over our lives. Anarchism is then; an analyses of what’s wrong with society, a strategy of how to change it, and a vision of a future based on solidarity, equality and freedom.